90mm Roundfin Racing Pistons!!! Forza Moto Guzzi! 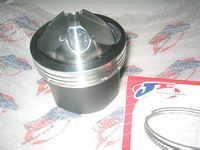 Now available from Guzzi Power : High Compression (approximately 13:1) 90mm Pistons for Moto Guzzi roundfin racers. These pistons are manufactured for us by JE Pistons, a leader in racing piston technology. Use of these pistons generally requires a rebore and possibly rebalancing of your crankshaft. 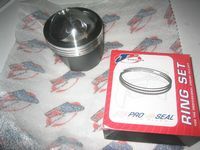 These pistons require 110 octane racing fuel and are recommended for closed course racing use only. Note: these pistons are slightly oversize compared to the older 90mm dome topped Wisecos that Raceco US used to sell, so they can be used as an 1st "oversize" piston for this application. We can also cut the domes on these pistons down to ~11:1 for street use.